Campaigners have revealed some of the "appalling" obstructions faced by pedestrians in Oxford. Members of the Oxford Pedestrians Association (OxPA went around the city centre on Saturday and tied 20 metres worth of yellow ribbon around items which blocked access to walkers. The event came 10 years after the group first toured the city to highlight the problem - and members believe there is still a long way to go. A-boards, poles, scaffolding and bollards were all targeted by the group, which claims Turl Street was one of the leading offenders. Association secretary Corinne Grimley Evans said Oxford’s streets still had a problem with obstacles. OxPA members met at Oxford Town Hall, in St Aldate’s, before heading to streets including St Giles, High Street and Cornmarket. Mrs Grimley Evans said pedestrians need to be catered for because of their importance to the city. 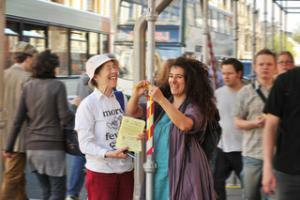 “Walkers can be tourists, shoppers or workers, all of whom are vital to Oxford and its economy. There needs to be more provision for pedestrians to help make their access around the city as easy as possible. In some places you see a whole group of people having to get into a single file line so they can edge past an obstruction. It is ridiculous when that happens. We would like the authorities to be more considerate about where they put things in Oxford." OxPA was founded in the mid-1990s when a group of friends decided to campaign to make the city more accessible for those on foot. Its aims include promoting walking, campaigning for the safety and convenience of pedestrians and making sure the needs of walkers are recognised in transport planning. Last month the Oxford Mail revealed how plans to pedestrianise large parts of the centre of Oxford had stalled. Oxfordshire County council had hoped Queen Street would be free of buses this year with much of the rest of the city centre pedestrianised by 2014, but now admits the scheme is unlikely to happen within the next 10 years.